Lieutenant Colonel Brent Lindeman currently serves as the Director of Future Operations for Special Operations Command Central. He is a graduate of Texas Christian University, receiving his commission as an Infantry second lieutenant through the Reserve Officer Training Corps in 1998. 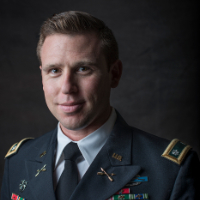 Lieutenant Colonel Lindeman’s initial assignment was to the 82nd Airborne Division, followed by the Special Forces Qualification Course and assignment to the 5th Special Forces Group (Airborne) where he commanded at the detachment, company, and battalion level. Lieutenant Colonel Lindeman deployed numerous times to Iraq in support of Operation IRAQI FREEDOM and Operation NEW DAWN; established Special Operations Command Central’s forward command center in Jordan; and, established Combined Joint Special Operations Task Force-Syria in support of Operation INHERENT RESOLVE. Lieutenant Colonel Lindeman is a graduate of the Naval Postgraduate School. He holds a Masters of Science in Defense Analysis. Lieutenant Colonel Lindeman is married and has four children.